If you have a kitchen or a bathroom, you know the countertops withstand a lot. In the kitchen, there is the continually cutting, scratching, and scraping, the never-ending spills, the hot pots, and the constant scrubbing to keep it clean. In the bathroom, there are different abuses including chemicals, cleaning, and spills like nail polish and remover, glue, and more. Today, metal countertops are growing in popularity, because of their reputation for near indestructibility. Let’s take a few minutes to explore the positives and negatives regarding metal countertops to determine if metal countertops are the right option for your home and family. Among the most familiar of the metals is stainless steel, probably because it is the choice of industrial kitchens everywhere. But growing in popularity are copper and zinc. The positives of this popular trio are many. They are waterproof, cannot be burned, resist all manner of stains, are seamless and virtually indestructible. Stainless is popular for euro-styling and industrial modern kitchens, while copper lends itself to nearly any décor, and zinc is ideally suited for Victorian homes through mid-century modern styles. The less than positive aspects of the metals are, by far, the costs. The metals pricing begins at $150 sq./ft., plus installation costs. Stainless is industrial strength but must be wiped daily to maintain its pristine appearance. Known as living metals, zinc and copper react to their kitchen environment changing color and texture through the years. Zinc oxidizes turning a lovely pewter hue, but it takes several years. Copper requires weekly polishing to maintain its copper sheen or it can be allowed to showcase its natural tarnished patina – Verdigris. 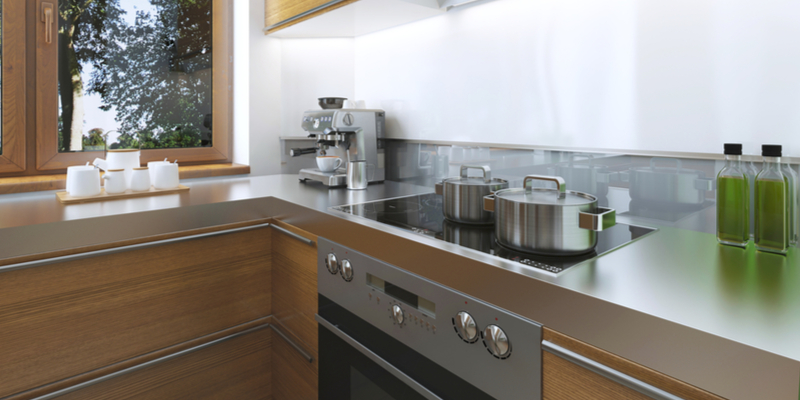 Stainless Steel – Stainless Steel is ideally suited for commercial, industrial, and residential countertops due to its unmatched resilience across the board. Stainless is unyielding to moisture, and offers a seamless application keeping dirt, grime, mold, and bacteria away. It is virtually impervious to stains, completely unbreakable, and won’t rust. In addition, stainless cannot be burned or cut. The downside to stainless is the cost, which at $150 per sq./ft. or higher is prohibitive to many homeowners’ budgets. The other negative is the look, which many equate with fast food or school cafeterias, and not high end design. Copper – Copper is a centuries old work surface and fits many styles from colonial to modern applications. Copper is anti-microbial, destroying bacteria and fungi, making it the ideal surface for food preparation. Copper is costly, often priced higher than stainless. It will show every mark, print, and spill tarnishing to a lovely greenish patina sought after by many homeowners. Unlike stainless, copper dents easily, so many homeowners choose hammered copper countertops so new dents are invisible. Zinc – Zinc’s lovely silver appearance appeals to many, but so does its charming oxidized dark blue patina. If you don’t love the patinaed look, you can slow down the process but not stop it completely. Before stainless, zinc was the metal of choice due to its long life and resistance to acidic liquids. And while like copper, it will show every mark, zinc essentially requires no care unless you are preserving the silvery shine. Zinc is also anti-microbial and thus a great food prep surface for any kitchen. Like copper, zinc is also prone to denting, making a number of homeowners opt for the hammered look to hide new dents with ease.